It was the wee hours of Monday morning some months back when my computer died while I was designing a brochure that had to be finished later that day. Without a computer what could I do? Dependency is a horrible thing. But rather than self-indulgently wallow in misfortune, I walked over to a flat file where I stored dozens of old press type sheets. It had not been open for a decade. Although I hadn’t worked with pressure sensitive materials since 1988 B.C. (before computer), I still knew how to use the burnishing tool (like riding a bike, you never ever forget), and began searching for any face I could find that included multiple letters of a full alphabet. The one that came closest to what I needed was Compacta Light (120pt). I know this was a bit rash. A few hours later my office building would be open and I could use the computer there. But the intense and obsessive anxiety of missing a deadline drove me to do the imponderable — return to those primitive, time-consuming methods when many like me spent hours making comps from Letraset, Formatt, Normatype, Letragraphica and Chartpak Velvet Touch lettering. I was so happy to forget that process. But you know what? The press down experience wasn’t half as bad as I remembered it. In fact it was kind of a Zen-like pleasure to revisit the old velum sheets of black-and-white letters I once so delicately placed on illustration board when metal or phototype was unavailable (or too expensive). Most young designers will never know how difficult it was to set type, unless you leased your own Compugraphic or PhotoTypositor. It took hours, sometimes days to spec and then get back galleys. Today it is as easy as opening a suitcase. So during the B.C. era press type was the poor-man/woman’s best means of hastily and cheaply composing display type. And it took real skill too. Pity those whose hands were unsteady. Expert burnish-people were worth their weight in gold, although they usually earned minimum wage. 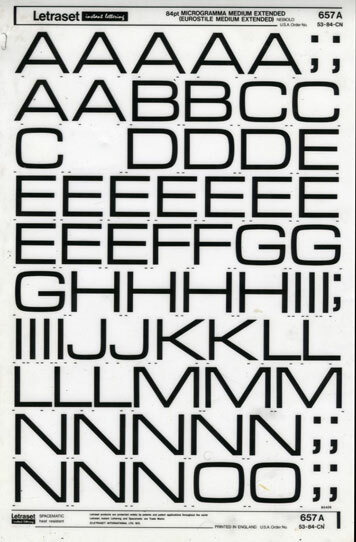 I recall the first time I was introduced to Letraset’s revolutionary “Spacematic,” a system of broken lines that when matched up served as a baseline. I thought I had found god — the results were so seemingly precise that even I could do it, (or that’s what I told myself.) When I looked at the type I set in this manner, I easily found many flaws. So I decided to make a virtue out of failure, and, proceeded to copy Dada typography with multiple styles used in a single line or word. It’s easy to become good when you start with mistakes as the standard. Recently, while throwing things out, I found yet another cache of my ancient “instant lettering.” There was not a single sheet that was not missing a few letters, and some were more decimated than others. 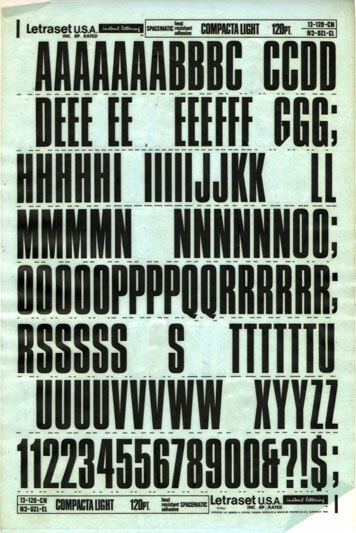 The sheets serve as a mini-history of typographic style, and personal proclivity. At least a dozen sheets of Avant Garde (med. 36pt) were in the folder, but with the exception of the AV combo, I never touched those dreadful ligatures. Other faces I remember using were Neon (I once composed an entire 200-word story at 24pt), Circus (there was something that said loving when using this face), Horatio Light (whatever came over me? ), Delfin (pressure-sensitive elegance), and Welt Extra Bold (a replacement for all those News Gothics). Of course, there were standard faces too: The first time I ever used Univers 45 + 75 was in this format. And my introduction to Helvetica, though it was called Geneva, was thanks to press type. I can’t bear to throw these sheets away. Someday (if not today) they may be seen as valuable artifacts from that interregnum between hot and cold type, and between photo and digital composition. The computer put pressure on the pressure-sensitive type companies to find alternatives (or go out of business). But there is something to be said for working with type in this way. As for me, I finished the brochure using Compacta Light and it looked wretched. So I went into the office early and redid the job. pencil or ink. You're right, too expensive to order. that slightly (or completely) out of control feeling. I am of an age that I didn't use Letraset on its first time around (I went straight into digital), though I have found much inspiration exploring creative uses of Letraset in the past few months. If you keep an eye out, you can find some great stashes on ebay. And how it feels good to use our hands and work close to paper,no? I grew up in the newspaper world,when there I designed the newspaper layout and ran down to the print room to watch the linotypist follow my design in metal and then set it in a frame,which was taken to a huge machine called in Portuguese a calandra and watch moments later the presses pull out the newspaper in print. I enjoyed every second of that process.At dawn I could hold in my hands the product of my sketches. It happened in the last century,when I was 17 years old. Ha!!!!!! I young adolescent,working as a minor in a country where women were not allowed to work or worse,frowned upon and dismissed in a derogatory manner. Great article. My father was a music typesetter BC. I remember rifling through stacks of Letraset in his office. It was a treasure for a kid to see and touch. On a slightly different note, my dad had a music typewriter. Unfortunately he sold it many years ago -- though I can still picture him carefully lining up the paper getting it ready to take whatever melody was next. As a 22 year old, I missed the "opportunity" (hassle?) to learn typography in this fashion. But I work with those who used to, and despite their tales of countless hours, dirty hands and smelly clothes, I can't help but envy their experience! Sorry your spec didn't come out well ... at least your essay did. aisle with stacks and stacks that are actually pretty well organized. gigposters to be screened. Cool effect. Nice observation. although they usually earned minimum wage. small fortune on those things back in my college days. them... especially the ones with "holes". more anachronistic than Letraset to me now. when you're looking at them on the computer screen. one only brings out for special occasions. I kick myself everyday for throwing out all of my press type when purging old files prior to a move to a new house a few years ago. Not just because I know what I spent on it, which was easily a third of my student loan total, but more the feeling of nostalgia and a sense of my history that seeing it invoked. Flipping through dozens and dozens of voweless sheets along with the occasional missing “Q” or “Z” if the instructor was in a punishing mood when assigning fake company names brought back a rush of memories both good and bad. Too many long, frustrating nights working on student design projects trying to achieve a perfection that was just out of my reach no matter how detail oriented I tried to be. But in hindsight I realized that those repeated exercises in futility ultimately gave me the skills and patience to be the designer that I am today. On the computer thank God. When was the last time that you dared to bill a client for EVERY minute spent on their job? Or, a lighter note … When was the last time that you set fire to someone's amberlith scraps in their ashtray? I'm in college right now for design, so to pay my way, I work part time at an art supply store. The store's been open for over 25 years - and since they've been open the artstore's been supplying all the local graphic designers/artists with their materials. When these sheets lost popularity, the store had a huge surplus. We still sell them today for $5.00 each, and they aren't going anywhere fast. We have hundreds (maybe thousands) left over from the 80s. Needless to say I've used them for many projects so far in college. I'm sad that I was never really taught how to properly use them. In the early 1980's, one of my first jobs during college was at WJZ-TV a TV station in Baltimore. Although the art department had one of the first computer graphics systems the Aurora, most of the broadcast graphics were created with Letraset Instant Lettering on clear film and clip art or photos from a slide library. You had to go from design concept to live broadcast in a matter of minutes. cheaper alternatives, but Letraset was always the Gold Standard. Christmas present!!! I was a strange child. part of my childhood again. duplicate the needed letters and run the sheets through a waxer. Lots of effort, but it was a state agency and we were on a budget. The thing I miss the most about those rub-down and paste-up days is how much time it gave you to think. We did research back then. At the library! Thought and care go together. Ah yes! I got my very first paid design job creating signs and posters with Letrasets. I, too, cannot bear to toss out my Letraset sheets. Steven mentions the PhotoTypositor machine (which I think is what Lorraine is describing). My father was a designer and owned one; he taught his three daughters to set type on it--and to kern properly! When our college got rid of its Typositor, I took the boxes of negative strips. Someday they will be part of a great project. I'm surprised to hear folks say they used Letraset as final art. Typositor set type for headlines in mechanicals. very fine brush (3-4 hairs)! Such joyful craftsmanship. Amazing! It's been years since i used those. I loved them already as a kid. Happy to hear they still exist - and get used, too! 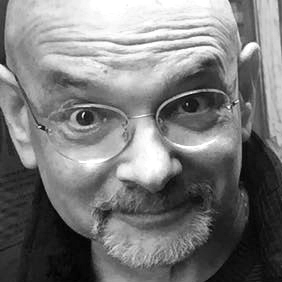 Thanks to Steven Heller for a very timely and inspiring commentary. Several terms come to mind when reading about press type: I would use the word "historical" since reams of this stuff were required to solve problems during my undergraduate education. My students have used the word "retro", probably as a semi-complimentary reference to my age. And historians with whom I work would likely use the word "kitsch". One pervasive aspect of this discussion concerns craftsmanship. I would claim that people who set metal type by hand or used transfer type materials learned and understood craftsmanship in a way which is different and probably superior than modern methods require. During my (pre-Mac) education at RIT in the early Eighties, we were simultaneously temped and confronted with both analog and digital methodologies for solving visual problems. Rubylith, technical pens, transfer type, photostats, Phototypositors, Compugraphics and creenprinting in one wing of our building, were met by four digital platforms and endless computer code in another. Having experienced all of these along with several generations of mouse-driven design, it's clear to me that those who worked in the pre-digital age have a better and more holistic sense of the term craftsmanship. Although this material now represents just a fond remembrance of days gone by, I'm glad to have been part of a culture that taught me the true meanings of words like "letterspacing" and "kerning". I once heard Wolfgang Weingart say that," to truly understand a three-to-the-em space, you must hold one in your hand". stock. Great for newspaper production! now have knowledge of the designer. and white. Eclipses, drop shadows, &c! What a hoot! I've got about 3 folders full of old Letraset and Chartpak sheets. Still use them for designing t-shirts, one-off posters, cards, mailers etc. I don't have an original burnishing tool but discovered that a wooden fish & chip fork does the trick! I wasn't even an art or design student, but I was involved in lots of student activities. I loved Chartpak and Letraset for all the various posters, postcards, and college newspaper ads I ended up designing. And I, too, still have sheets and sheets. Thanks for the remembrance! In high school I was fortunate to have an art teacher who had an extensive background as a professional graphic artist. He had a large collection of Formatt and Zipatone lettering sheets. They weren't rubdown, they were cutout! You had to use your X-acto knife to cut out each letter, printed on the back of shiny cellophane, and stick the letters down one by one, then burnish. Many years later, at a commercial printer's, I got to use the PhotoTypositor. What a miraculous machine! I did a whole booklet, 24 pages, in 14-point type that I set as about 30-point then cut and pasted line by line. Fortunately it wasn't justified! I was using a brand new typeface—Avant Garde! Wow! Cool! Somehow seems appropriate the code I had to enter to post this comment was "tears78." Your post conjures up wonderful memories - what a wonderful thing! Remember when the transition to computer was just starting and you could pick from about 7 fonts from Adobe. I dare say you open a larger arena than just press type when you speak of the Zen experience of graphic design. So much of that is lacking with monitor, keyboard and mouse. In a paper folder in a metal file cabinet, I, too, have an old stash of these Letraset pages. When I started in the art department at The Muppets, I did a lot of things like this but gradually learned to spec type, order the galleys, use the old waxing machine... do mechanicals (didn't learn this in fine arts). A young designer turned us onto the Mac and doing mechanicals on the computer, revolutionary for my boss and me as well. At some point, we will be like the Colonial Williamsburg of type, pulling out these sheets and explaining to people who have iPhones imbedded in their palms, that we once did things this way. 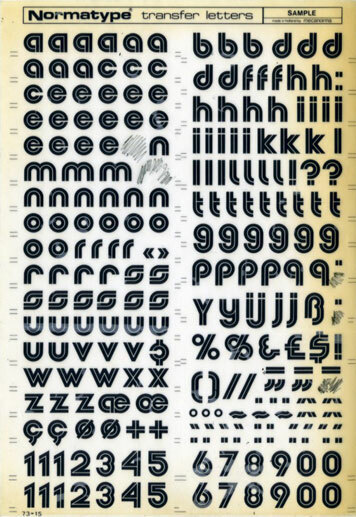 Oh crikey, I remember Letraset very well. I used to use it a lot as part of my craft projects when I was a kid. I can remember all the problems with it but at the same time is sometimes nice to have something that's a bit more hands-on than a computer. funny, not only do i remember these, i use them currently, as well, in my artwork! i love them. i go to the local art store and there they are, in a dusty corner where no one but me lovingly picks them up and takes them home. this is a great article to send to my team of young designers. Especially when they send me pages to proof with inch marks where quotes should be...and then tell me "oh it must be the computer." The beautiful thing about setting type this way is that there is a personal responsibility with every letter that goes down. The computer is obviously a great tool but we should use it to set type with the same reverence as we would if we were using these sheets. The next time I see a dreaded inch mark cross my desk, i'm going to task my team with producing a layout the old-fashioned way. My first real design gig was assisting the real designers at Chartpak just outside Northampton, Mass. Aside form the pay (which wasn't bad for an 11th grade summer job) the best part was when one of the designers handed me a requisition form & explained that I should just flash it at the warehouse ladies & then load up on Letraset & markers. "Don't be greedy" he warned "only do this once or twice a day". I still have piles of the stuff. At the time, I think I had the most typographically complete (and complex) 'zine in Western Massachusetts. The adhesive does dry up over time, but the sheets are fun to scan & mess with. band, designing the field formations (my job), then autographing the music (my job, too) - which meant actually writing each instrument's music on staves in india ink, ready for photographing, then negatives made and sensitized plates made (we had to make our own plates and bake them in a little oven), then finally printed (on a little Multilith), then gathering the little pieces into packets (big job sometimes mine, too), packing and shipping to all those eager high schools throughout the country. I remember vividly the rush to get "I Saw Mama Kissing Sana Claus" out in time for the pre-holiday season. And Mona Lisa" for Homecoming; And guess what the formation was for "Chattanooga Shoeshine Boy". For type I either handlettered or used PresType or similar. Several years later, when I did a very arty book of mostly illustrations (for which we cut paper masks like silkscreens and followed the photo-offset process bypassing negatives for the illustrations). Couldn't afford hot type, so we had Letraset do our hand cut letters on their wax-backed sheets. Easier now, but not nearly so close to the process. Thanks for getting us to think. I kept a couple of sheets of 24pt Avant Garde Medium and Light with alternates and all. still taped to a piece of foamboard just waiting for the right idea. it's rad! Steven Heller is an icon. How could he EVER tarnish his hands with press type! LOL ... guess we all have to start somewhere. Steve Heller is just a kid compared to some of us. Just after leaving Harold Cohen's first class at SIU in the fall of 1955, I got a job as a paste up artist at an advertising agency in St. Louis. And if you were really good, you could make up missing letters by combining the letters you had left on the sheet, like making an R out of a P or a P out of a B.
I worked as a church secretary for several years, many moons ago, and used Letraset, etc. to created innumerable posters, flyers, brochures, etc. We rarely paid for anything to be professionally printed, but would take the "master" down to Sir Speedy for duplication. It worked great for our purposes and our budget. Good times. WOW, haven't used those in years but still have a few sheets for old times sake! Nothing like hands on experience . . . sizing photos, specing type, ganging photos, using the stat camera and the list goes on. Sure do miss all that hands on work. Wow. This post and some of the comments brought back some memories. I was one of those expert burnish people as well as a Typositor operator and mechanical artist. It's true what e.m. said about the sense of personal responsibility for each letter. It's also good to be free of the responsibility for cleaning and maintenance of Typositors, stat cameras and other evil-smelling photographic devices!